Welcome to the website of Stewart Watkiss. I’m a Data Centre Manager, a STEM Ambassador, an author, a first aider, an assistant Cub Scout Leader and most importantly a husband and father of two children. You can find out a bit more about Stewart Watkiss. Any comments or suggestions contact me using my email form. I have recently been upgrading some of my home automation. I already use Energenie Pi-Mote to control some electrical power sockets, I’ve now replaced some of my light switches with Sengled home automation light bulbs. Initially I’ve been using my Pi-power software running on a Raspberry Touch Screen and some timed actions to automatically turn lights on and off at certain times of the day. 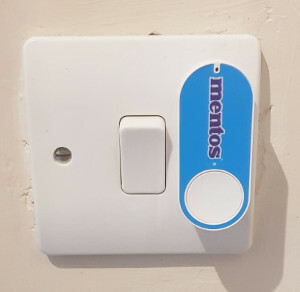 I’ve now reconfigured some of my now unused Amazon Dash buttons so that they can control both the Sengled Light Bulbs and the Energenie remote control sockets. Unfortunately Amazon appear to have discontinued the regular Dash buttons. They have created an IoT Amazon Dash Button it’s much more expensive than the product specific ones. If you have some old dash buttons around then it is a useful way to give them a new lease of life in home automation. For the Energenie connections then using the “standard” sockets there is no way of knowing the current state of the plug, as even if you kept track of how it has been triggered through the pi-power app, someone could have pressed the button on the front of the socket. There are new versions that can report back their status, I haven’t got any of those at the moment, but I hope to add that feature in future. This works well if you already have some of the Amazon Dash Buttons available, it’s a great way of making good use of those that you may have available.